Something is not quite right. Joan seems to, “not be herself”. Joan has less energy in the evenings than she usually has. She is taking more time in the bathroom than usual. Joan is waking up in the middle of the night more often than she ever has in the past. All these previous observations made by a Direct Support Professional are, what we call in the world of the NADSP Competencies, the skill and competency of Assessment.Direct Support Professionals should be knowledgeable about formal and informal assessment practices in order to respond to the needs, desires and interests of the people they support. Direct Support Professionals don’t give themselves enough credit for being skilled at assessment. In the case of Joan, it is the DSP’s observations that are critical in helping Joan get the medical, psychological or emotional support she may need to help her get well. 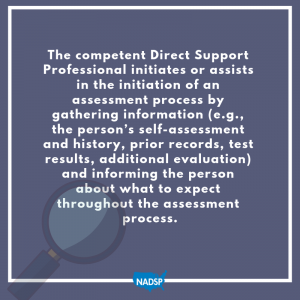 The competent Direct Support Professional initiates or assists in the initiation of an assessment process by gathering information (e.g., the person’s self-assessment and history, prior records, test results, additional evaluation) and informing the person about what to expect throughout the assessment process. Direct Support Professionals have an enormous role in the holistic support of people with disabilities. Medical, psychiatric and emotional assessment can be formal with the use of standardized testing tools like the Mini Mental Status Exam, PTSD Check List, The Social Interaction Anxiety Scale (SIAS), etc…When these tools are being used with someone the primary role for the Direct Support Professional is to support that person as these assessments are being facilitated by another professional such as a physician or social worker. 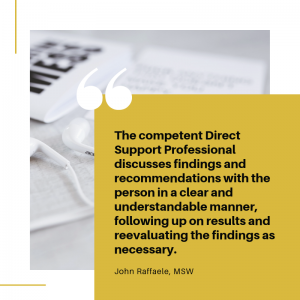 The competent Direct Support Professional discusses findings and recommendations with the person in a clear and understandable manner, following up on results and reevaluating the findings as necessary. Between the relationship that is built between a Direct Support Professional and a person, along with the use of effective communication, the findings and recommendations of any assessment can be translated, monitored and supported. Often, it is scary or confusing when we are asked to change behavior or habits etc.. The outcome of assessment is usually indicated with advice to; change lifestyle, adjust diet, take new medicine, change one’s routines, and so forth. It becomes so important for Direct Support Professionals to assist people with such advice and to continue the ongoing informal assessment process. We have heard Direct Support Professionals say they need to have “eyes in the back of their head” and that their head must be on a swivel. When supporting people in group settings or even when supporting people with lots of energy or dynamic personalities, the DSP must be “on” all the time. This breeds amazingly keen Assessment skills and, though informal in nature, many Direct Support Professionals are so good at knowing the people they support and ensuring safety, dignity and health. Direct Support Professionals must recognize that they have an obligation to constantly and intentionally discover and assess the many aspects of a person’s whole life. This goes well beyond what is read in a person’s “chart” or “record”. Documentation is important (we will discuss this in a later post and Documentation is one of the fifteen NADSP Competencies). However, the informal ways in which Direct Support Professionals identify and discover important things about the people they support are rooted in the deep bonds that are built in the professional relationship. When they understand this then we will begin to see Direct Support Professionals get more credit where credit is deserved. Get updates about webinars, resources, news, policy issues, events, and more! 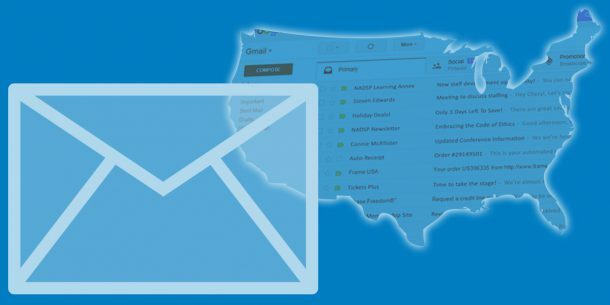 Thank you for signing up to receive NADSP Emails!